Practicing Bhakti purifies our consciousness, making us fit to revive our relationship with God. Krishna is all-pure. We are now contaminated by material consciousness and must again become all-pure before we can associate with Him. 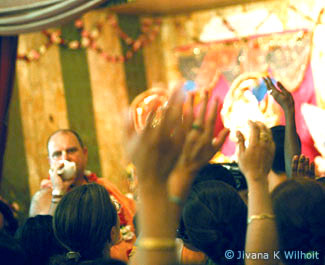 Chanting, or speaking about, Krishna's transcendental name, form, qualities, pastimes, paraphernalia, and so on. Offering Krishna respectful worship in His Deity form. Considering Krishna one's best friend. Surrendering everything to Krishna by serving Him with body, mind, and words. To bear fruit, these practices must be performed under the guidance of a pure teacher, an advanced devotee of Krishna.